Its been tabbed as the Million Dollar Courtroom, but in todays currency that would be a small price to pay for the architectural elegance of the surroundings. 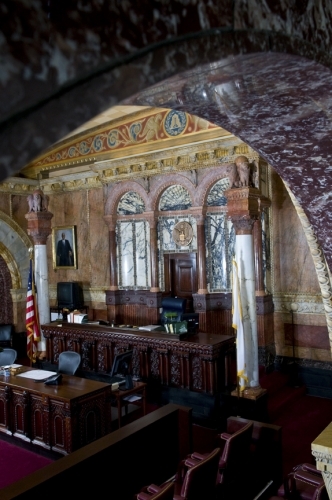 There is a richness and history that are hard to quantify when considering the magnificence of the Chief Judges Courtroom at the Theodore Levin Courthouse in downtown Detroit. Money, in stark financial terms, doesnt do justice to the design of the place, which is the centerpiece of the U.S. District Court for the Eastern District of Michigan. It truly is one of Detroits hidden gems, says Gerald Rosen, chief judge of the 21-member U.S. District Court bench. Its design and its historical significance rank with any courtroom in the country. U.S. Supreme Court Chief Justice John Roberts echoes the sentiment. During a September visit to the Detroit court, Chief Justice Roberts called it one of the finest and most beautiful courtrooms he has seen, according to Judge Rosen. He really marveled at the beauty of the place and the architectural detail throughout, Judge Rosen says of Chief Justice Roberts. He was really struck by it. Of course, not all who walk through the grand mahogany doors of the court are as smitten by its stature. Its difficult to tell if the defendants fully appreciate the courtroom they are in, Judge Rosen says with a smile. I will leave that to them. Judge Rosen, now in his 19th year on the federal bench, does appreciate the ironic circumstances that bring some into the Million Dollar Courtroom. There are, of course, all sorts of white-collar criminal defendants, including on this recent day a man charged with perpetrating an elaborate Ponzi scheme that defrauded scores of investors of millions of dollars in funds. His alleged illegal gain stands in stark contrast to the cost of preserving a court that many consider a priceless judicial asset. The courtroom, after all, has been preserved and reconstructed in its original state. It was part of the first federal courthouse built on the Lafayette Street site in 1896. The building, of Romanesque design, reportedly was constructed for the magical sum of $1 million and once was considered the finest building in Detroit, according to a brochure prepared by the Historical Society of the U.S. District Court for the Eastern District of Michigan. But by the early 1930s, several years into the throes of the Great Depression, the building was demolished to make way for a bigger and better courthouse, an Art Deco style structure costing four times the amount of the original judicial facility. In 1931, then Chief Judge Arthur Tuttle appealed to William Rush of the Treasury Department to save his district courtroom from demolition, according to the brochure. Of particular value were the marble walls of the courtroom, approximately 30 different types that came from many states and foreign countries. In 1931 terms, the marble alone was estimated to be worth more than a million bucks, a seven-figure amount that newspapers quickly latched onto when describing the opulence of the court. As a result of Chief Judge Tuttles perseverance in preserving the courtroom, he earned the moniker, The Judge Who Wouldnt Budge, since, legend has it, he refused to agree to the construction of the new courthouse until the government agreed to pay for the preservation of the courtroom, Judge Rosen says. When the courtroom was meticulously reassembled in the fall of 1933 in the new courthouse, it bore almost an identical look to its architectural forerunner, aside from the floor and ceiling that had been modernized to pre-World War II standards. The grandeur of the court perhaps is most visible in the judges bench, an elaborately carved work made of East Indian mahogany. Appearing over the bench, according to court historians, is a frieze of 10 female figures depicting the purity of justice, an accent complemented around the courtroom by a frieze of lion heads. On either side of the bench are two 12-foot columns made of white marble with pink marble bases. Perched atop each column are four lions holding up a globe, vanguards of the strength of justice. The columns, according to the brochure, are the finishing touch on a courtroom filled with emblems of the 19th century Americans sentiment for their legal system, complete with symbols from Greek mythology and biblical times. Special medallions appear throughout the federal courtroom, each a clock-like design featuring Mexican onyx with white, salmon and black marble. Eye-catching arches over doors and windows contain a band of crenellation molding on top with a band of cabling underneath, all in sandy colored marble. Fittingly, a portrait of the courtrooms savior, Judge Tuttle, has a prominent place up front, and hangs in perpetuity in the courtroom. Other portraitures are of Chief Judge Arthur Lederle, appointed to the bench in 1936 by President Franklin D. Roosevelt; Chief Judge Theodore Levin, namesake of the federal court building; and Chief Judge Damon Keith, now of the U.S. 6th Circuit Court of Appeals. Judge Keith, a champion of civil rights and one of the most distinguished members of the federal judiciary, served on the U.S. District Court bench from 1967-77, eventually rising to Chief Judge before he was appointed to the U.S. Court of Appeals. During his time with the District Court, Judge Keith handed down perhaps his most important decision in the case of United States v. Sinclair, a ruling unanimously affirmed by the U.S. Supreme Court. In Sinclair, Judge Keith ruled against the federal government in its attempts to engage in warrantless wiretapping, holding that such conduct violated the Fourth Amendment right against unreasonable searches and seizures. It is such a moving experience to be in that courtroom, says Judge Keith, recalling such cases as the eight-month trial of Anthony Giacalone, one of the suspects in the 1975 disappearance of Teamsters President Jimmy Hoffa. It inspired me as a judge, and Im sure that the juries, the attorneys, and others who worked there have felt the same. You want to walk the extra mile in the pursuit of truth and justice when you are in that courtroom.